Call me old-fashioned. Call me a housewife. Call me Betty Crocker. I. Don't. Care. Sunday suppers are my jam. They started at my Grandparent's house, where, in true Italian style, the food and family were in no short supply. They continued on at my Mom's where all hands were on deck to create a mouthwatering meal. And today, the tradition lives on in the RC household where Mr. RC and I use the time to unwind and relax and indulge in some really good food. In a world that seems to change faster than the speed of light, clinging to traditions that remind you to slow down and savor what's important are, well, important. The Mr. and I enjoy and look forward to our Sunday evenings spent cooking, and eating, a meal that's simple enough not to take all day, yet special enough to make it stand out from the rushed suppers of weeknights. Depending on the season, and what we're craving, we'll make everything from seafood to pasta, but one of our favorites is classic roast chicken. It may be one of the simplest things to make (you need a mere few ingredients), yet it may be one of the most delicious (when prepared correctly). Plus, anything that gives me leftovers for rest of the week earns extra brownie points in my book. 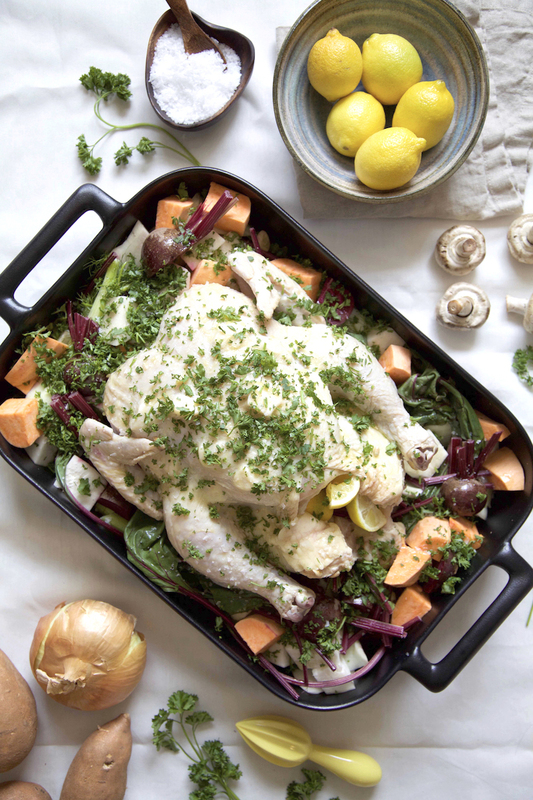 I recently got this Revol baking dish that has made roast chicken and vegetables even easier and more delicious than I ever thought possible. Seriously. Cast iron style glazed pans are total game changers when it comes to the roasting of chickens. They help everything to get crispy and caramelized but they aren't anywhere near as heavy as a cast iron pan. Get one now. Do it. You'll only regret it if you don't. Plus, Revol is a French company (We all know how I feel about French things...swoon!) and all their dishes are made in France so you know they're good, because, well it's France...they don't do not good! I literally put everything on their site in my cart before Mr. RC reigned me in and I settled on the afore mentioned pan, a square baking dish, these vinegar and olive oil cruets (can be seen in the background of the picture of me cooking) and a new dish set for our new kitchen (because our mismatched set just wasn't cutting it anymore). Of course, dinner isn't complete if there isn't dessert involved. We'll eat pretty much any sweet treat from cookies to chocolate to ice cream, however, we usually take the opportunity of more cooking time to make a more involved dessert. Coming from a family of excellent pie makers means fruit and cream pies are always a favorite, but my absolute, ultimate, I-could-eat-it-every-day pie is strawberry rhubarb. 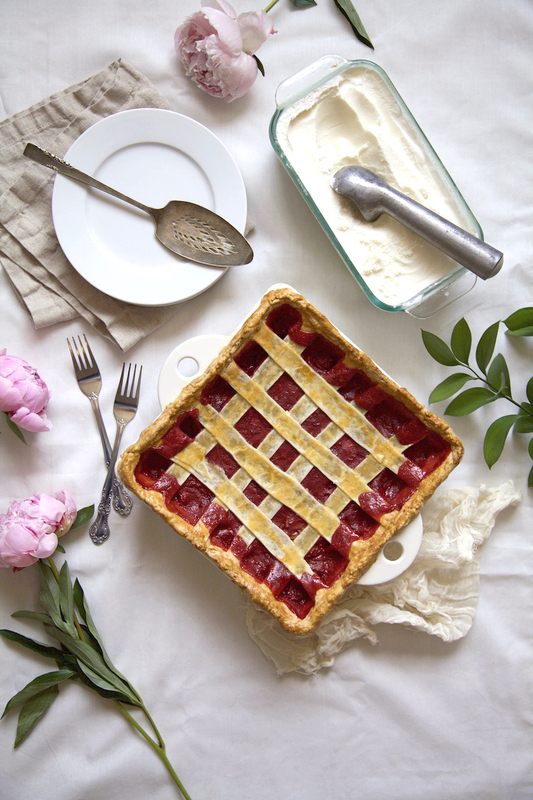 My Grandfather grew rhubarb in his garden so strawberry rhubarb pie was frequently on our tables growing up, and now it's one of the desserts I crave the most in the summertime. For our most recent Sunday supper, I switched it up and made it into more of a deep dish slab pie by using this Revol dish as opposed to a regular pie plate. It was something fun and different, and who can be mad about more filling?! Certainly not me! Are Sunday Suppers a "thing" in your house? If so, what do you usually have to eat/make/serve? Rinse out your chicken and then pat it dry with paper towels. Let it set (on a glass dish, glass baking sheet, etc...basically anything that isn't wood). Meanwhile, chop up your veggies. Things like mushrooms and garlic I like to leave whole whereas bigger veggies I like to cut into quarters or eighths. Sprinkle your veggies in the bottom of your roasting pan. Place the chicken on top. At the base of the breast (closer to the cavity), lift the skin and pop several cloves of garlic under the skin and spread throughout the breast area. Generously baste the top of the chicken with melted butter, pouring an extra over the veggies, then drizzle everything (chicken and veggies) with olive oil (the Revol Olive Oil jar that I linked to is a perfect, no-mess solution for this step). Squeeze on the juice of 1 or 2 lemons, then stuff the lemon halves into the chicken cavity, along with a few more cloves of garlic, a few pieces of onion and a handful of fresh herbs. Back on the top of the chicken, sprinkle the skin with fresh ground pepper and salt (I love to use garlic salt for extra flavor or some flaky Maldon salt). Use your (very clean) hands to rub the salt and pepper into the skin. Then, after giving your hands a good wash, sprinkle everything with a generous helping of chopped fresh herbs. Pop into the oven and bake. For best results to ensure a juicy and moist chicken, cook the chicken at 425 degrees for 30-40 mins (depending on weight of the bird). Then bring the temperature of the oven to 350 degrees and cook the chicken for another hour to hour and a half. For a chicken under 7 lbs, use the lower end of the time tables. When the skin on the chicken has turned a nice golden brown color, be sure to place a piece of aluminum foil on top of the chicken and baking pan. This will prevent the top of the chicken from burning and the meat from drying out. It is very important not to enclose the entire baking pan with the foil as it can result in steaming the chicken. To check to see if the chicken is done, place a thermometer into the breast, being sure to not touch the bone. Once the temperature reads 165 degrees, take the chicken out and let cool for about 5 mins. Then slice and serve. In a large pot, set over medium heat, combine the fruit with the flour and sugar. Cook, stirring frequently, so the sugar and fruit does not burn. After a few minutes the fruit should start to have their juices oozing out of them, and after about 20-30 minutes, the fruit should be soft and falling apart when lightly smashed with a spoon. Also, the juices should have thickened. Allow the filling to cool (it can be made ahead and stored in the fridge, tightly covered, overnight). Lightly grease your pie pan with butter (not because you need more butter but because greasing the pan will help the bottom of the crust to keep from getting soggy as well as allow it to turn golden brown). Line your pan with crust that has been rolled to about 1/8" thick, making sure the edges hang over at least an inch or two. Roll out your remaining dough about 3 inches longer than your pan and then cut it into approximately 1/2" strips. If you've made the crust ahead of time, at this point, cover the baking pan with plastic wrap (you can lay the lattice pieces out on a baking sheet to store them) and store it in the fridge overnight, then resume with the next step prior to baking. Lightly baste the pie shell with some of the beaten egg (again to help the crust from getting soggy), before pouring in the cooled pie filling. Lay your pie crust lattice pieces across how you wish (if you need to cut off a little extra, now is the time to do so), then roll the edges up and over, firmly pressing all the way around to seal everything in. Baste with the egg wash.
Bake at 425 degrees for 5 minutes, then turn the oven down to 350 and bake for another 45-50 minutes (allow less time if you have no crust on top and about 10 minutes extra if you have a full crust on top). Keep an eye on your pie as it bakes and cover with foil if the edges start to burn. Remove from the oven and allow to cool slightly before serving, ideally with vanilla ice cream. Cover leftovers with plastic wrap and, though the crust may get a bit soggy, store in the fridge (to keep the filling from getting moldy in the summer humidity). Thank you to Revol for sponsoring this post.